Pdf To Djvu Gui portable. Pdf To Djvu Gui is now portable (ver 2.0). As says the name it is a free pdf to djvu converter. It writes the settings on an ini file. Re: Pdf To Djvu Gui portable. Added to the database here. The results really amazed me! 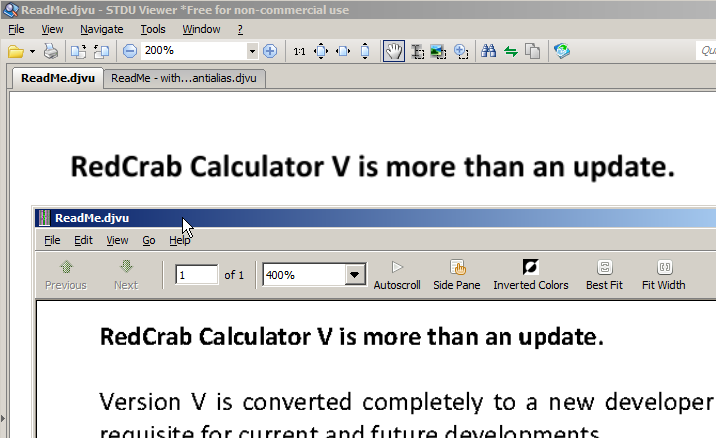 Resulting .djvu files are half of the original pdfs size! And look very good in WinDjvu. I use a JPE version of WinDjvu. You can also use a JPE version of STDU Viewer. I'll keep looking for a natively portable djvu viewer (or we could spam Mr. Andrew Zhezherun with requests, for he already promised this feature a year ago ). There is a called portable version for the last release of stduviewer 1.5.597. Has anyone tested it ? ArnaudNime wrote: There is a called portable version for the last release of stduviewer 1.5.597. Great news about STDU Viewer. Though I had my own NSIS-compressed portable STDU weighting only 1.4 MB but I'm happy to switch to the official one. If you use default settings with 150 dpi, you get a file 1/3rd the size of the original PDF. This was expected as a good chunk of what FileOptimizer does to compress files is just a smaller DPI. If you do the same but uncheck antialias, you get a file 1.6% the size of the original. Seriously. The text doesn't look super sharp but it's very readable as well as searchable. I haven't seen space savings like that since I started converting large BMPs to JPG back in the 90s. Anyway, if you could package a lightweight viewer in with whatever software you're distributing, it might make sense to distribute DJVU files rather than PDFs.